​Good news. After repeated discussions with the City of Austin, we have worked out an agreement to make more parking available. Now the parking lot at the Mopac overpass is available to students who have an Austin High parking tag. Stephen F. Austin Drive (both sides) from Cesar Chavez to the west side of school. This is the street adjacent to the softball/baseball fields and the track. The tennis court lot is Seniors ONLY (orange permit). The Mopac overpass paved parking lot (past the tennis courts). Please note that the street becomes Vetarans Drive at the Tennis courts and is NOT available to students. The street from the Tennis courts extending up the hill to Lake Austin Blvd. is meter parking – paid by the hour, 3 hour maximum. Students parking on Stephen F. Austin Drive or the Mopac parking lot MUST have a student permit or must pay at parking meters. Staff parking (including visitor spots) is off limits to students on both the east and west sides. Violaters may be ticketed, booted or towed. Students who park in designated students lots without a valid permit face the same consequences. So, please obtain a permit. Active enforcement of student lots will begin on February 15th. Please obtain your permit before then. To obtain a permit, fill out the online application including verification of driver’s license, insurance, and vehicle information including license plate. Pay the $15 permit fee – online payment only. 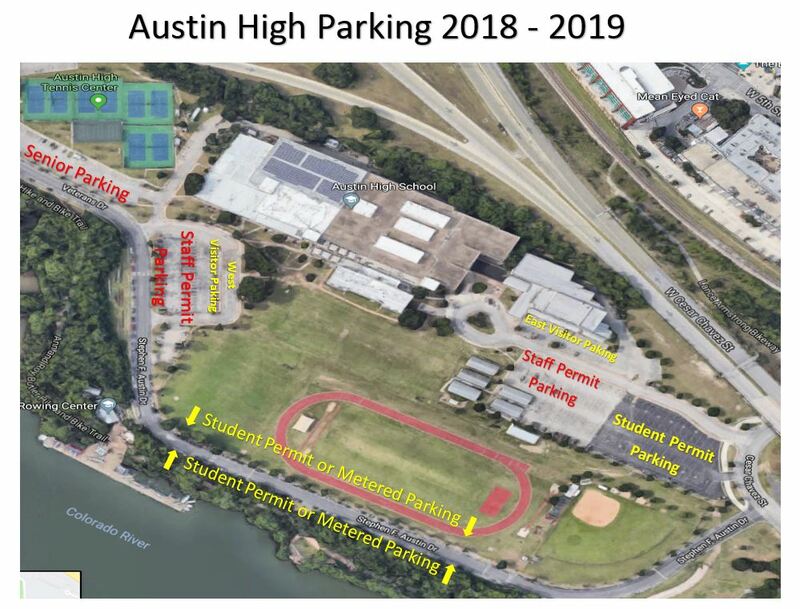 Once this is done, you can bring Ms. Linda Garcia, our building manager, a copy of your receipt or email her a copy to linda.a.garcia@austinisd.org to receive your parking permit.